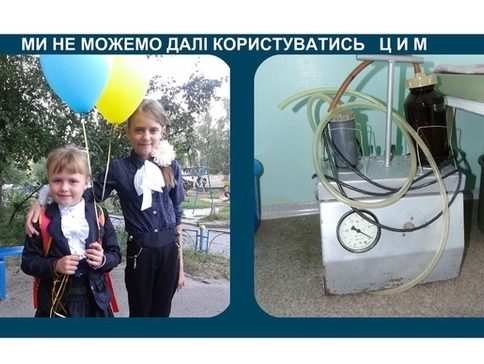 "The electric suction was manufactured back in Soviet times. It's always needing repairs, and it is impossible to make an adequate procedure for the removal of sputum". "Children are getting respiratory treatments using nebulizers not meant for hospital use." This is the pulmonology department, which admits children with breathing problems. How can one provide medical care for the children in such conditions? In the Sumy Children's Regional Hospital, the pulmonology department has 30 beds; 10 for children with allergic respiratory illnesses and 20 for the children with other respiratory illnesses, which include cystic fibrosis, various chronic respiratory illnesses, congenital respiratory illnesses, severe and complicated pneumonia, and recurrent bronchitis. All of these children need nebulizer treatments because nebulizer is the only way to get the medications deep inside the lungs and to treat the infections which lodge there. But for hospital use, one must have special nebulizers--strong enough to withstand heavy daily use, and also ones that can be easily disinfected. A weak device is simply unable to deliver the medications deep enough into the lungs--the medications would settle in the throat, not reaching the bronchi, and the nebulizer treatment would last half an hour instead of 5 minutes. That is unacceptable. Suction is used when it is necessary to clear the respiratory passages of mucus if the child isn't able to clear it by coughing. A child might be very short of breath only because the respiratory passages are clogged, and that is where the special medical suction can help. With the aid of this section, it is also possible to get sputum samples for culture, to determine what microorganisms caused the illness, which is especially important for the younger children. These are very basic pieces of equipment, which really will help children get the needed treatment faster and...perhaps even save someone's life. Make this a reality, support us! Total need 23 816 UAH.